Background: Several studies have investigated hypopharyngeal cancer (HC) risk in combination with xenobiotic metabolism-related genetic polymorphisms and the burden of alcohol consumption and smoking in European countries but not in East Asian countries. Patients and Methods: This hospital-based case–control study involved 61 male patients with HC and 71 male cancer-free controls. Information on age, body mass index, and alcohol and cigarette consumption was obtained from medical records, a self-completion questionnaire, and a thorough interview by an otolaryngologist. Alcohol dehydrogenase 1B (ADH1B), aldehyde dehydrogenase 2 (ALDH2), cytochrome P450 A1 (CYP1A1) MspI, CYP1A1 Ile462Val, glutathione S-transferase (GST) M1, GSTT1, and GSTP1 gene polymorphisms were determined by polymerase chain reaction-based methods. Univariate and multivariate analyses were performed by adjustment for age by the Mantel–Haenszel method. Results: The burden of alcohol and cigarette consumption significantly increased the risk of HC and showed a synergistic effect. ADH1B*1/*1 (odds ratio [OR] 7.34) and ALDH2 *1/*2 (OR 13.22) were significant risk factors for HC. Individuals with ADH1B*1/*1 or ALDH2 *1/*2 who consumed alcohol were more susceptible to HC. However, polymorphisms of CYP1A1 gene and GSTs were not significant cancer risk factors in patients with HC. Conclusions: ADH1B*1/*1 and ALDH2 *1/*2 were significant risk factors for HC, while polymorphism of CYP1A1 gene and GSTs was not a significant risk factor for HC. These polymorphisms determined the effects of alcohol and cigarette smoke in addition to burden of alcohol and cigarettes intake on the risk of HC. Excess consumption of alcoholic beverages and a smoking habit are well-known risk factors for head-and-neck cancer, particularly hypopharyngeal cancer (HC) and laryngeal cancer (LC). These lifestyle factors are attributed to approximately 80% of head-and-neck cancers according to the WHO report. Because people who are heavy drinkers and smokers do not always develop HC or LC, individual susceptibility to these cancers may be modulated by genetic polymorphisms in xenobiotic metabolizing enzymes, in addition to the burden of alcohol and smoking themselves. ADH1B and ALDH2 determine the effective conversion of ethanol to acetaldehyde and its subsequent oxidation to acetate. ADH1B (accession number rs1229984, Arg48His) and ALDH2 (accession number rs671, Glu487 Lys) have genetic polymorphisms that define their enzymatic activity. The homodimer of ADH1B encoded by ADH1B*1/*1 has only 1/100th and 1/200th of the ethanol-oxidizing capacity of the isozymes encoded by ADH1B*1/*2 and ADH1B*2/*2. The mutant allele ALDH2 *2 encodes an inactive subunit of ALDH2; its homodimers have null ALDH2 activity; and its heterodimers have approximately 6% residual activity. ALDH2*2 is frequently found in East Asian populations, whereas nearly all Europeans are homozygous for the ALDH2*1 and ADH1B*1/*1 alleles. Several reports have examined esophageal cancer and alcohol metabolic enzyme polymorphisms.,, In one meta-analysis of reports from China, Japan, Thailand, Africa, and Europe, the crude odds ratio (OR) for esophageal cancer was 2.91 for ADH1B*1/*1 and 1.32 for ADH1B*1/*2 compared with ADH1B*2/*2, whereas it was 2.52 for ALDH2*1/*2 compared with ALDH2*1/*1. However, there are few reports on HC and their polymorphisms from East Asia., The influence of alcohol on HC risk varies with ethnicity, and gene polymorphisms in ADH1B and ALDH2 may differently affect cancer risk. Two functional polymorphisms are known in the cytochrome P450 A1 (CYP1A1) gene: A 3698T>C substitution (CYP1A1*2A, rs 4646903) creating an MspI restriction site in the 3'-flanking region and a 2454A>G substitution (CYP1A1*2C, rs 1048943, Ile462Val) in exon 7. CYP1A1 MspI and CYP1A1 Ile462Val mutations have been associated with increased risk of head-and-neck cancers. Glutathione S-transferases (GSTs) are a family of Phase II xenobiotic metabolizing enzymes catalyzing conjugation reaction reactive intermediates of electrophilic compounds with cytosolic glutathione. In humans, GSTs are mainly coded for at five loci: GSTA (a), GSTT1 (h), GSTM1 (l), GSTP1 (p), and GSTM3 (c). GSTM1 products catalyze the conjugation of glutathione to epoxide derivatives of polycyclic aromatic hydrocarbons, which are the main carcinogens found in cigarette smoke. GSTT1 products are important in the detoxification of naturally occurring monohalomethane, dichloromethane, and ethylene oxides. GSTP1 enzyme is widely expressed in the body and detoxifies various potential carcinogens including cigarette smoke-derived substances such as benzopyrene diol epoxide and acrolein. The polymorphic site in the coding DNA sequence of the GSTP1 gene is characterized by an adenine (A) to guanine (G) transition at nucleotide 313, translating an isoleucine to valine substitution at codon 105 (Ile105 to Val105) in exon 5. GST enzyme activity is significantly lower among individuals with the 105Val allele in the GSTP1 gene. The GSTM1 null and GSTT1 null genotypes are associated with increased risk of head-and-neck cancer.,, Individuals with the Ile/Val and Val/Val genotypes have a significantly higher risk of head-and-neck cancer than those with the Ile/Ile genotype. However, there are inconsistencies among studies. The aim of this study was to clarify the relationship between genetic polymorphisms related to alcohol and tobacco smoke metabolism and cigarette smoking and alcohol intake burden on the risk of HC in Japanese individuals. This case–control study involved 61 male patients with HC who gave written informed consent for the study participation. All HC patients were treated at the university hospital between April 2008 and December 2012. During the same period, 71 cancer-free male controls who were treated for inflammatory disease and benign tumors, such as chronic sinusitis, chronic tonsillitis, and benign salivary tumor, were also enrolled. The controls had no cancer-related history. The study protocol was approved by the Institutional Review Board. This study was conducted in accordance with the principles of the Declaration of Helsinki. Information on age at the first visit to our institute was obtained from medical records. Detailed history of alcohol consumption and smoking behavior was obtained from cancer patients and the controls before they started any treatment through a self-completion questionnaire and thorough interview by an otolaryngologist. The burden of cigarette use was reported as daily cigarettes by years. Daily alcohol consumption was expressed in grams/day of ethanol. All blood samples were collected into ethylenediaminetetraacetic acid-containing tubes and stored as the buffy coat. Genomic DNA was extracted from the buffy coat using standard protocols with phenol–chloroform extraction and stored at −20°C. ADH1B and ALDH2 polymorphisms were identified using MslI and MboII (New England Biolabs Japan, Tokyo, Japan) polymerase chain reaction (PCR)-restriction fragment length polymorphism (PCR-RFLP). The PCR-amplified products of ADH1B and ALDH2 were digested according to the manufacturer's instructions with the restriction enzymes as described and analyzed following electrophoresis in agarose gel. CYP1A1 MspI and CYP1A1 Ile462Val polymorphisms were detected by melting temperature analysis of PCR products amplified with quenching probes using the fully automated genotyping system i-densy TM 5310 (Arkray Inc., Kyoto, Japan); these techniques are named quenching probe methods. GSTM1 and GSTT1 polymorphisms were identified by multiplex PCR. GSTP1 polymorphisms were identified using BsmAI (New England Biolabs Japan) PCR-RFLP. The primer sequences used for amplifications and the quenching probe sequences are listed in [Table 1]. Pearson's Chi-square test was used to compare age between cases and controls. Adjustment for age by the Mantel–Haenszel method was used to compare alcohol consumption and smoking behavior between cancer cases and controls. ORs with 95% confidence intervals (CIs) were used to assess the strength of the association between alcohol consumption, smoking behavior, polymorphisms, and HC risk. Univariate ORs with 95% CIs were calculated after adjustment for age by the Mantel–Haenszel method. Multivariate ORs with 95% CIs were calculated by binominal logistic regression with the stepwise method. All analyses were performed with SPSS Statistical Package (SPSS for Windows, Version 23.0; SPSS, Inc., Chicago, IL, USA). P < 0.05 was considered statistically significant. The clinical characteristics of the HC patients and the cancer-free controls are shown in [Table 2]. Patients with smoke consumed only cigarettes, and there was no smoker who consumed cigars, chewing tobacco, or tobacco pipes. The HC patients were significantly older than the controls. The HC patients were more likely to smoke and drink than the controls. Synergistic consumption of alcoholic beverages and cigarettes in the HC patients is shown in [Table 3]. More than 20% of the HC patients both consumed 50 g/day alcohol and had a Brinkman index ≥800, whereas only 4.2% of the controls did. The OR reached 17.72 in the HC patients compared with patients who consumed small amounts of cigarettes and alcohol. 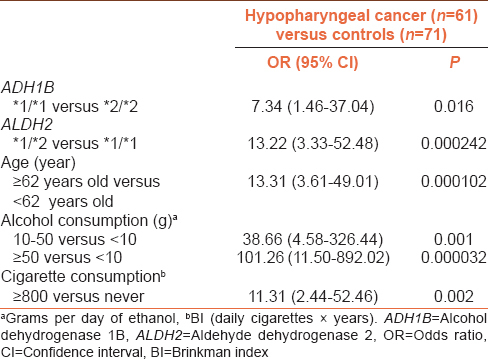 Alcohol consumption and ADH1B and ALDH2 polymorphisms in cancer patients and controls are shown in [Table 4]. Those who consumed ≥10 g/day had a higher risk of HC than those who consumed <10 g/day. 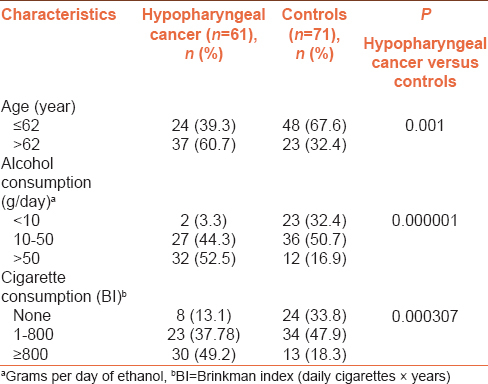 HC patients who consumed 10–50 g/day of ethanol had an OR of 16.52 (95% CI 2.76–99.06, P= 0.001), which increased to 36.74 (95% CI 6.50–207.72, P= 0.000001) for those who consumed ≥50 g/day [Table 4]. Compared with ADH1B*2/*2, ADH1B*1/*1 was associated with an increased risk of HC, with an OR of 7.25 (95% CI: 2.55–20.83, P= 0.000243). Compared with ALDH2*1/*1, ALDH2*1/*2 was associated with an increased risk of HC, with an OR of 6.35 (95% CI: 2.68–15.06, P= 0.000015). These ADH1B and ALDH2 polymorphisms showed a synergistic effect with alcohol on the risk of HC [Table 4]. [Table 5] shows the effects of the relationship between alcohol consumption and ADH1B and ALDH2 polymorphisms on the risk of HC. ADH1B*1/*1 genotype carriers who consumed <50 g/day had a higher risk of HC than ADH1B*2/*2 genotype carriers (OR: 8.20, 95% CI: 1.84–37.04, P= 0.008). ALDH2*1/*2 carriers who consumed <50 g/day had a higher risk of HC than ALDH2*1/*1 genotype carriers (OR: 6.76, 95% CI: 2.27–20.14, P= 0.001). ALDH2*1/*2 genotype carriers who consumed ≥50 g/day also had an increased risk of HC compared with ALDH2*1/*1 genotype carriers who consumed ≥50 g/day (OR: 12.97, 95% CI: 1.52–110.42, P= 0.032). Smokers had an increased risk of HC compared with never smokers [Table 2]. A Brinkman index ≥800 was associated with an OR of 7.51 [95% CI 2.56–21.98, 0.00031, [Table 6]. The effects of smoking burden and genetic polymorphisms (CYP1A1 MspI, CYP1A1 Ile462Val, GSTM1, GSTT1, and GSTP1) on HC are shown in [Table 6]. There were no significant correlations between the polymorphisms examined and cancer risk. [Table 7] and [Table 8] show the cancer risk of polymorphisms according to smoking burden. In HC, there were no significant correlations between polymorphisms and cancer risk for any smoking burden. The multivariate ORs of selected factors for HC are shown in [Table 9]. In HC, ADH1B and ALDH2 polymorphisms were associated with an increased risk, in addition to alcohol consumption, large smoking burden (Brinkman index ≥800), and age. Compared with ADH1B*2/*2, ADH1B*1/*1 was associated with an increased risk of HC (OR: 7.34, 95% CI: 1.46–37.04, P= 0.016). Compared with ALDH2*1/*1, ALDH2*1/*2 was associated with an increased risk of HC (OR: 13.22, 95% CI: 3.33–52.48, P= 0.000242). The lifestyle regarding with alcohol intake and cigarette smoking was quite different between male and female in Japan. The incidence of head–and-neck cancer is also much higher in male than female. For this reason, we employed only male participants in the present study. The rates of drinking and smoking and the burden of alcohol and cigarette consumption were markedly higher in the HC patients than in the controls. To minimize the sample size effect, the Mantel–Haenszel method was used to control age as influential confounding factors. Although the sample size was limited, our main findings of interest are that ADH1B*1/*1 and ALDH2*1/*2 were significant risk factors for HC. Multivariate analysis also revealed alcohol consumption, even low consumption of alcohol beverages was the dominant risk factor for HC, and a high burden of cigarette consumption was the dominant risk factor for HC. Salivary acetaldehyde is at least partly derived from the salivary glands. Salivary acetaldehyde levels of participants with inactive ALDH2 are higher than those of participants with active ALDH2 after ethanol ingestion. In addition, acetaldehyde from microbial oxidation of ethanol by the oral microflora is also important for increasing salivary acetaldehyde levels, especially in heavy drinkers and smokers. Asakage et al. reported that inactive ALDH2*1/*2 and less-active ADH1B*1/*1 were significant independent risk factors for HC among moderate-to-heavy drinkers but that inactive ALDH2*1/*2 was not a significant risk factor for oral and oropharyngeal cancers. Because ALDH2 activity in the tongue, gingiva, and esophagus is weak, and there has been no precise evaluation of ALDH2 activity in the hypopharynx and larynx, this subsite difference in ALDH2 activity may have influenced their findings. Because previous reports sometimes combined HC with laryngeal, oral, and oropharyngeal cancers as head-and-neck cancers when assessing cancer risk, the subsite difference should be taken into account when considering the results. In the present study, ADH1B and ALDH2 polymorphisms were prominent risk factors for HC by direct exposure to strong alcoholic beverages. Mutant alleles encoding an inactive subunit of ALDH 2*2 and a superactive subunit of ADH1B*2 are highly prevalent among Japanese at 42% and 93%, respectively. Although controls in the present study had a relatively high rate of ALDH2*1/*1 and ADH1B*1/*1 compared with mainland Japanese, the prevalence of these polymorphisms is similar to those in East Asian countries and markedly different from those in Europe. In the present study, according to ADH1B analysis, never to moderate drinkers (0–50 g/day) with ADH1B*1/*1 showed a significant elevation in HC. Because there was no heavy drinker (>50 g/day) control with ADH1B*1/*1, the OR of ADH1B*1/*1 in heavy drinkers could not be calculated. However, 46.9% of HC patients harbored ADH1B*1/*1, unlike 0% of controls. Thus, in our Japanese population, ADH1B*1/*1 became a risk factor for HC even in those who consume small amounts of alcohol. According to ALDH2 analysis, never-to-moderate drinkers with ALDH2*1/*2 showed significantly elevated risk of HC. Thus, ALDH2*1/*2 becomes a risk factor for HC even in those who consume little alcohol. Synergistic effects of ADH1B and ALDH2 polymorphisms on cancer risk were observed for HC, suggesting that these polymorphisms affect hypopharynx carcinogenesis. Some studies have investigated smoke metabolism-related polymorphisms and head-and-neck cancers., Ours is the first report to investigate CYP1A1 MspI, CYP1A1 Ile462Val, GSTM1, GSTT1, and GSTP1 polymorphisms in relation to HC in a Japanese population. The data obtained from the controls in the present study were quite similar to the previous polymorphism data in Japanese. However, in Japan, polymorphisms in CYP1A1 Msp1, GSTM1, and GSTP1 were associated with lung cancer risk; in the present study, there was no polymorphism examined that was related to HC risk. A literature search found significant associations of GSTM1 and GSTT1 gene polymorphisms with head-and-neck cancer, particularly oral cavity cancer, although conflicting data including LC were present.,,,, Stratified according to ethnicity, there was an increased risk of head-and-neck cancer in Asians with GSTM1 and GSTT1 null genotypes compared with Americans and Europeans. Our findings suggest that the influence of enzymatic polymorphisms related to the detoxification of cigarette smoke-derived substances differs among head-and-neck subsites. Substantial evidence indicates that smoking and drinking synergistically increase the risk of oral and pharyngeal cancer. The present case–control study clearly revealed that high alcohol and cigarette consumption significantly increased the risk of HC. In addition, alcohol consumption was more prominent risk factor compared with cigarette consumption in HC from the multivariate analysis [Table 9]. Because the hypopharynx is part of the digestive tract, it may be more easily affected by alcohol than cigarette smoke. Several studies have investigated HC risk in combination with xenobiotic metabolism-related genetic polymorphisms and the burden of alcohol consumption and smoking in European countries but not in East Asian countries. In the present study, ADH1B*1/*1 and ALDH2 *1/*2 were significant risk factors for HC, while polymorphism of CYP1A1 gene and GSTs was not a significant risk factor for HC. These polymorphisms determined the effects of alcohol and cigarette smoke in addition to burden of alcohol and cigarettes intake on the risk of HC. This study was supported by and conducted in cooperation with the Ryukyu Society for the Promotion of Otorhinolaryngology. The funders had no role in study design, data collection and analysis, decision to publish, or preparation of the manuscript. We deeply thank former professor Tsukasa Uno, Department of Pharmacy, University Hospital, University of the Ryukyus, for his support of this study. This study was supported by a KAKENHI grant (no. 60569622) from the Japan Society for the Promotion of Science to Dr. Yamashita. This study was also supported by and conducted in cooperation with the Ryukyu Society for the Promotion of otorhinolaryngology. The funders had no role in study design, data collection and analysis, decision to publish, or preparation of the manuscript. We deeply thank former professor Tsukasa Uno, Department of Pharmacy, University Hospital, University of the Ryukyus, for his support of this study. Thomposn LD. 5.8 Head and neck cancers. In: Bernard W, Stewart CP, editors. World Cancer Report 2014. Lyon, France: The International Agency for Research on Cancer; 2014. p. 422-30. Higuchi S, Matsushita S, Murayama M, Takagi S, Hayashida M. Alcohol and aldehyde dehydrogenase polymorphisms and the risk for alcoholism. Am J Psychiatry 1995;152:1219-21. Gilder FJ, Hodgkinson S, Murray RM. ADH and ALDH genotype profiles in caucasians with alcohol-related problems and controls. Addiction 1993;88:383-8. Eriksson CJ, Fukunaga T, Sarkola T, Chen WJ, Chen CC, Ju JM, et al. Functional relevance of human adh polymorphism. Alcohol Clin Exp Res 2001;25:157S-163S. Luczak SE, Glatt SJ, Wall TL. Meta-analyses of ALDH2 and ADH1B with alcohol dependence in asians. Psychol Bull 2006;132:607-21. Risch A, Ramroth H, Raedts V, Rajaee-Behbahani N, Schmezer P, Bartsch H, et al. 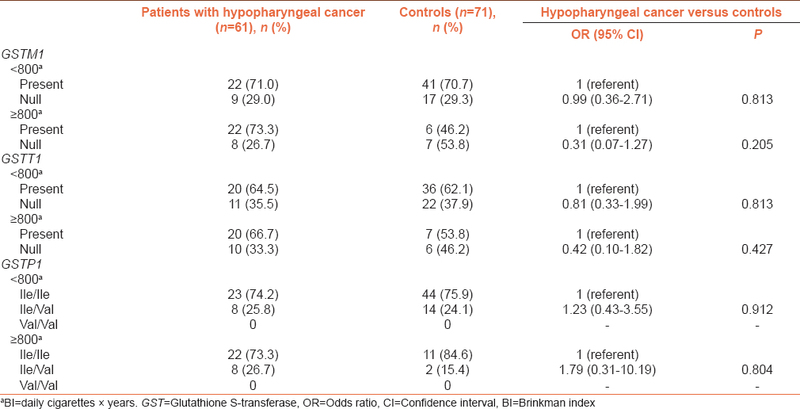 Laryngeal cancer risk in caucasians is associated with alcohol and tobacco consumption but not modified by genetic polymorphisms in class I alcohol dehydrogenases ADH1B and ADH1C, and glutathione-S-transferases GSTM1 and GSTT1. Pharmacogenetics 2003;13:225-30. Bosetti C, Gallus S, Franceschi S, Levi F, Bertuzzi M, Negri E, et al. Cancer of the larynx in non-smoking alcohol drinkers and in non-drinking tobacco smokers. Br J Cancer 2002;87:516-8. Harty LC, Caporaso NE, Hayes RB, Winn DM, Bravo-Otero E, Blot WJ, et al. Alcohol dehydrogenase 3 genotype and risk of oral cavity and pharyngeal cancers. J Natl Cancer Inst 1997;89:1698-705. Buch SC, Nazar-Stewart V, Weissfeld JL, Romkes M. Case-control study of oral and oropharyngeal cancer in whites and genetic variation in eight metabolic enzymes. Head Neck 2008;30:1139-47. Matsuo K, Rossi M, Negri E, Oze I, Hosono S, Ito H, et al. Folate, alcohol, and aldehyde dehydrogenase 2 polymorphism and the risk of oral and pharyngeal cancer in japanese. Eur J Cancer Prev 2012;21:193-8. Liu L, Wu G, Xue F, Li Y, Shi J, Han J, et al. Functional CYP1A1 genetic variants, alone and in combination with smoking, contribute to development of head and neck cancers. Eur J Cancer 2013;49:2143-51. Asakage T, Yokoyama A, Haneda T, Yamazaki M, Muto M, Yokoyama T, et al. Genetic polymorphisms of alcohol and aldehyde dehydrogenases, and drinking, smoking and diet in Japanese men with oral and pharyngeal squamous cell carcinoma. Carcinogenesis 2007;28:865-74. Baan R, Straif K, Grosse Y, Secretan B, El Ghissassi F, Bouvard V, et al. Carcinogenicity of alcoholic beverages. Lancet Oncol 2007;8:292-3. Boffetta P, Hashibe M. Alcohol and cancer. Lancet Oncol 2006;7:149-56. Yin SJ, Bosron WF, Magnes LJ, Li TK. Human liver alcohol dehydrogenase: Purification and kinetic characterization of the beta 2 beta 2, beta 2 beta 1, alpha beta 2, and beta 2 gamma 1 “Oriental” isoenzymes. Biochemistry 1984;23:5847-53. Crabb DW, Edenberg HJ, Bosron WF, Li TK. Genotypes for aldehyde dehydrogenase deficiency and alcohol sensitivity. The inactive ALDH2(2) allele is dominant. J Clin Invest 1989;83:314-6. Yoshida A, Huang IY, Ikawa M. Molecular abnormality of an inactive aldehyde dehydrogenase variant commonly found in orientals. Proc Natl Acad Sci U S A 1984;81:258-61. Edenberg HJ. The genetics of alcohol metabolism: Role of alcohol dehydrogenase and aldehyde dehydrogenase variants. Alcohol Res Health 2007;30:5-13. Yokoyama A, Muramatsu T, Ohmori T, Higuchi S, Hayashida M, Ishii H, et al. Esophageal cancer and aldehyde dehydrogenase-2 genotypes in japanese males. Cancer Epidemiol Biomarkers Prev 1996;5:99-102. Oze I, Matsuo K, Wakai K, Nagata C, Mizoue T, Tanaka K, et al. Alcohol drinking and esophageal cancer risk: An evaluation based on a systematic review of epidemiologic evidence among the Japanese population. Jpn J Clin Oncol 2011;41:677-92. Yang SJ, Yokoyama A, Yokoyama T, Huang YC, Wu SY, Shao Y, et al. Relationship between genetic polymorphisms of ALDH2 and ADH1B and esophageal cancer risk: A meta-analysis. World J Gastroenterol 2010;16:4210-20. Bartsch H, Nair U, Risch A, Rojas M, Wikman H, Alexandrov K, et al. Genetic polymorphism of CYP genes, alone or in combination, as a risk modifier of tobacco-related cancers. Cancer Epidemiol Biomarkers Prev 2000;9:3-28. Strange RC, Fryer AA. The glutathione S-transferases: Influence of polymorphism on cancer susceptibility. IARC Sci Publ 1999;148:231-49. Cheng L, Sturgis EM, Eicher SA, Char D, Spitz MR, Wei Q, et al. Glutathione-S-transferase polymorphisms and risk of squamous-cell carcinoma of the head and neck. Int J Cancer 1999;84:220-4. Hashibe M, Brennan P, Strange RC, Bhisey R, Cascorbi I, Lazarus P, et al. Meta- and pooled analyses of GSTM1, GSTT1, GSTP1, and CYP1A1 genotypes and risk of head and neck cancer. Cancer Epidemiol Biomarkers Prev 2003;12:1509-17. Masood N, Yasmin A, Kayani MA. Genetic deletions of GSTM1 and GSTT1 in head and neck cancer: Review of the literature from 2000 to 2012. Asian Pac J Cancer Prev 2013;14:3535-9. Morita S, Yano M, Tsujinaka T, Akiyama Y, Taniguchi M, Kaneko K, et al. Genetic polymorphisms of drug-metabolizing enzymes and susceptibility to head-and-neck squamous-cell carcinoma. Int J Cancer 1999;80:685-8. Lang J, Song X, Cheng J, Zhao S, Fan J. Association of GSTP1 ile105Val polymorphism and risk of head and neck cancers: A meta-analysis of 28 case-control studies. PLoS One 2012;7:e48132. Takahashi H, Mizuta T, Oeda S, Isoda H, Nakashita S, Kawaguchi Y, et al. An automated rapid detection system using the quenching probe method for detecting interleukin 28B and inosine triphosphatase single nucleotide polymorphisms in chronic hepatitis C. J Viral Hepat 2013;20:e124-6. Väkeväinen S, Tillonen J, Agarwal DP, Srivastava N, Salaspuro M. High salivary acetaldehyde after a moderate dose of alcohol in ALDH2-deficient subjects: Strong evidence for the local carcinogenic action of acetaldehyde. Alcohol Clin Exp Res 2000;24:873-7. Homann N, Tillonen J, Meurman JH, Rintamäki H, Lindqvist C, Rautio M, et al. Increased salivary acetaldehyde levels in heavy drinkers and smokers: A microbiological approach to oral cavity cancer. Carcinogenesis 2000;21:663-8. Yin SJ, Chou FJ, Chao SF, Tsai SF, Liao CS, Wang SL, et al. Alcohol and aldehyde dehydrogenases in human esophagus: Comparison with the stomach enzyme activities. Alcohol Clin Exp Res 1993;17:376-81. Dong YJ, Peng TK, Yin SJ. Expression and activities of class IV alcohol dehydrogenase and class III aldehyde dehydrogenase in human mouth. Alcohol 1996;13:257-62. Brennan P, Lewis S, Hashibe M, Bell DA, Boffetta P, Bouchardy C, et al. Pooled analysis of alcohol dehydrogenase genotypes and head and neck cancer: A HuGE review. Am J Epidemiol 2004;159:1-6. Kiyohara C, Horiuchi T, Takayama K, Nakanishi Y. Genetic polymorphisms involved in carcinogen metabolism and DNA repair and lung cancer risk in a Japanese population. J Thorac Oncol 2012;7:954-62. Zhuo WL, Wang Y, Zhuo XL, Zhu B, Zhu Y, Chen ZT, et al. Polymorphisms of CYP1A1 and GSTM1 and laryngeal cancer risk: Evidence-based meta-analyses. J Cancer Res Clin Oncol 2009;135:1081-90. Zeng W, Li Y, Lu E, Ma M. CYP1A1 rs1048943 and rs4646903 polymorphisms associated with laryngeal cancer susceptibility among Asian populations: A meta-analysis. J Cell Mol Med 2016;20:287-93. Goldstein BY, Chang SC, Hashibe M, La Vecchia C, Zhang ZF. Alcohol consumption and cancers of the oral cavity and pharynx from 1988 to 2009: An update. Eur J Cancer Prev 2010;19:431-65.